I still have a whopper of a cold. Since I spent virtually the entire day flopped on the couch watching TV, I figured I should crawl into the kitchen and make dinner. In the fridge was a package of former tilapia. Bought it on Sunday for cooking yesterday, but somehow forgot about it (when you come home from work one day and Hubby is making spaghetti, you don't waste time peeking in the fridge to remember what you planned on making). Since I have said cold and didn't think it smelled that bad, I asked Hubby, who pronounced it DOA. Also in the fridge was skirt steak, which was still in its prime (get it, prime? Oh, I kill me sometimes!) of its life. 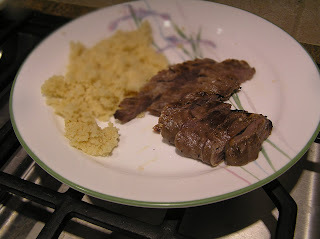 Once upon a time I posted a recipe for Skirt Steak with Ponzu Sauce, but it had several more ingredients and was a little (and by a little I mean a lot) more complex than the more streamlined version I found at The Perfect Pantry. I am coming down with a cold, but being the typical Jewish martyr mother I am, I still have to get ready for the pre- and post-Yom Kippur meals. So easy is good. Not in the mood for more bruschetta as the appetizer, so I used what little energy I have left in an attempt to find something just as easy. YES! Chicken Satay Bites! The hardest part of the recipe is defrosting the bag of shredded chicken you conveniently stashed in the freezer. If that's too difficult, then go out and buy a pre-roasted chicken. I'll wait. This recipe makes a ton, which is good if you are feeding a lot of company or a couple of teenagers.